Villa Romanazzi Carducci hotel preserves with the greatest respect the memory of the residence of a noble feudal family from Putignano who has owned the historical structure for about a century. 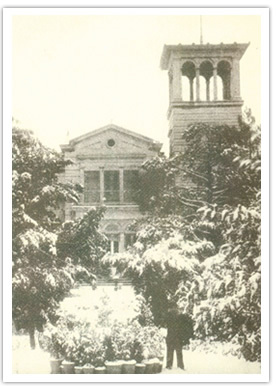 In 1885 the two brothers, Giuseppe Maria and Orazio Romanazzi Carducci, bought this ancient mansion from Federico Maurizio Liebe, a native German merchant; at that time, Villa Romanazzi was described as follows: “A rustic area of the right extension, about 88 feet and 20 sq. m, of fertile land with fruit trees and appropriate decorations placed in the neighborhood of this city, in Contrada Torre Rossa o Quattrobocche” where there was already “a building or small house with a ground floor and a first floor with different rooms equipped with wood furniture and also shutters on the balconies” . Mrs De Blasi purchased the building lot in 1876 while later Mr Liebe built the structure and created all the existing equipment. So, this villa was erected by a member of that foreign bourgeoisie who come to Bari in the 19th with the aim of prospering in business and trading activities. Federico Maurizio Liebe managed import-export activities of wine, oil and food in Via Cafarella; he was a member of the “Banca Cooperativa della società di mutuo soccorso” as well as an affiliate of the “società anonima di navigazione a vapore” , founded in 1876 in Bari. He married Bertha Mastaller, the daughter of the first German citizen who moved to Bari in the 19th to build up his holiday home in “Villa Lucae”. 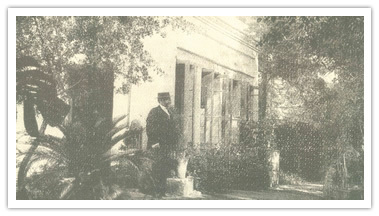 Mr Liebe sold his new luxurious villa to Romanazzi Carducci’s brothers, whose parents were the marquis Giuseppe Natale and the baroness Giulia de Notaristefani. Romanazzi’s Family, feudal family of Putignano since Middle Ages, at the end of the XVIII century, thanks to the marriage between Giuseppe Natale and Rachele Carducci, belonging to the noble family of Taranto, had the opportunity to use this noble surname as prestigious gift that the bride’s family made to the groom. 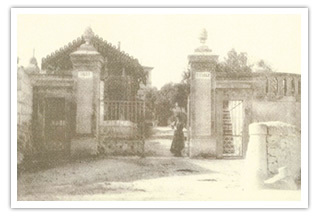 In 1893, considering that Giuseppe Maria and his wife moved to Villa Romanazzi in Bari while Orazio lived in Putignano, the two brothers decided to exchange their buildings according to their own needs; Giuseppe Maria kept his villa in Bari while his brother Orazio chose for the palace in Putignano. After this exchange, Giuseppe Maria could freely dispose of the Villa where he stayed with her wife and three children: Leonardo, Giulia and Anna, who died prematurely. Some years later, he bought another villa increasing his patrimony, which became one of the most beautiful of the whole city of Bari. He called the two properties Villa Rachele, in honor of his wife and Villa Giulia because in honor of his first daughter. Half a century later, Giuseppe Maria’s heirs sold the structure to a society who converted Villa Romanazzi into a Great Hotel. 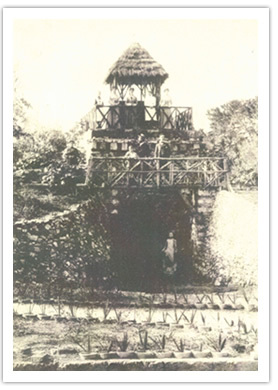 The change of destination and the destruction of one Villa modified the original configuration of the complex; but the new use of the estate has determined the valorization of its beautiful park. Finally a great restauration work contributed to give more value to every area of this historical and prestigious Villa. The existing Villa, the oldest one, is characterized by the articulation of a series of buildings with different volumes which give an idea of movement to the complex which has in common only the wide windows which underlines the relation between internal spaces and external environment. Meanwhile the restoration of the property, some building have been maintained like the Vaccheria, the actual Sala Europa used for meetings and private events, and the nice little guardroom inspired to the French chalets, the actual administration office. The park seems to be well finished; it is characterized by a huge variety of aromatic trees and some garden furniture such as rocks, balustrades, statues that all together provide a real English romantic atmosphere. Oaks, pines, bay trees and olive trees grow in the same garden together with black locust, acacia and flowers shrubs; all these plants decorate and increase the natural environment. After 130 years Hotel Mercure Villa Romanazzi Carducci‘s guests still have the possibility to admire and stay in such impressive and historical place with its smiling, professional and friendly staff.